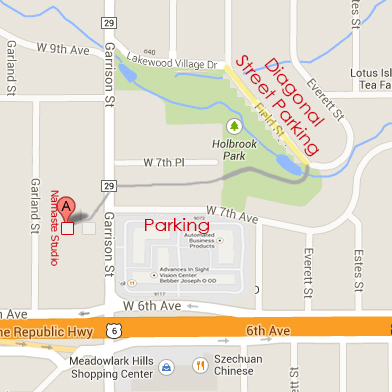 Directions:701 Garrison Street ~ Lakewood, CO ~ 80215Namaste Studio is located 1 block north of 6th Ave. on the west side of the street. The studio is at the top of the driveway.There is room for approximately 10 cars in the parking lot which is located in between the studio and the house at the top of the driveway. North on Garrison from 6th Ave.
Right/East on Lakewood Village Dr.
Park at bottom near the bridge and walk up the path to the col de sac of 7th Pl. Namaste Studio is located at the top of driveway behind the house.